Description: This gun safe is widely used, but is it the best one for you? Learn the facts in our First Alert 5200df review. This review is going to go over all the pertinent details about this product. It has gotten a lot of feedback online and most are positive. But is it as good as advertised? Having had a lot of experience with both good and bad gun safes, I decided to take a closer look at the First Alert. The First Alert is made from heavy duty 18 gauge steel, giving you peace of mind that your handgun is safe inside. Aside from the steel, the safe has powder coating for extra durability even when exposed to the elements. The gun safe is solidly built and should fit most handguns. 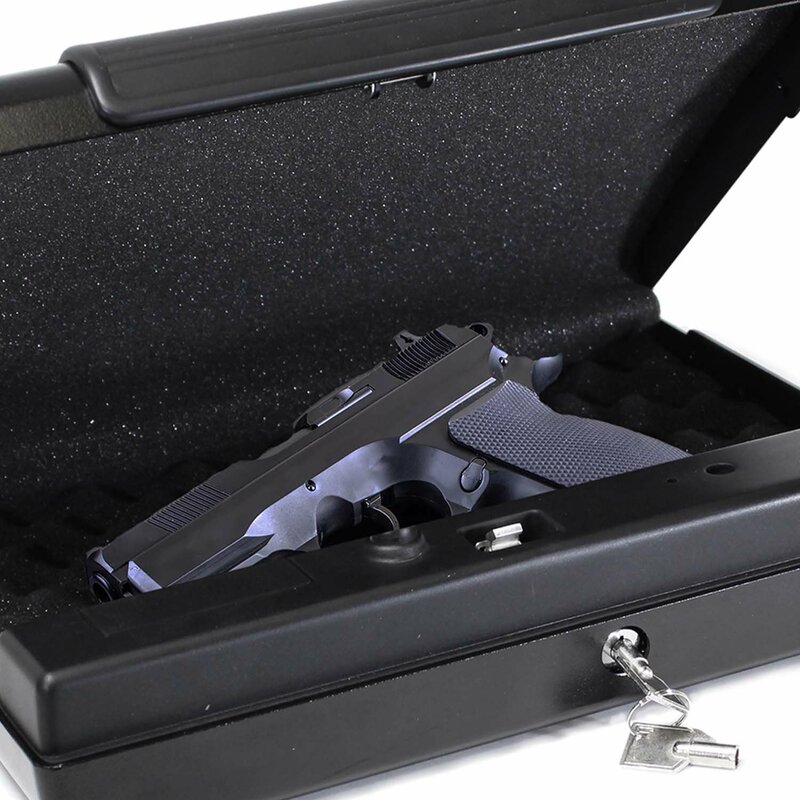 The dimensions of the safe were chosen so that the most popular handguns can be placed in the safe easily. A full 1911 will fit nicely for instance. A revolver can be placed in the safe without problems either. A well-made gun safe must strike a balance between accessibility and make sure that no one without permission gets to your gun. That is precisely what you get here. Its hinge has spring load assistance so youll be able to open the safe rapidly in the event of an emergency. Accessibility is one of the most important elements for a gun safe, so it is good to know First Alert put a lot of attention here. Its easy to panic in case of a problem, so this is a nice feature. Another hallmark of a good gun safe is its portability. The First Alert weighs only 4 lbs so you wont have any problems packing this along for the ride. The lightweight aside, it does not compromise when it comes to security. But if you give more priority to heavily built big safes, other First Alert gun safe reviews will help you to make the right choice. 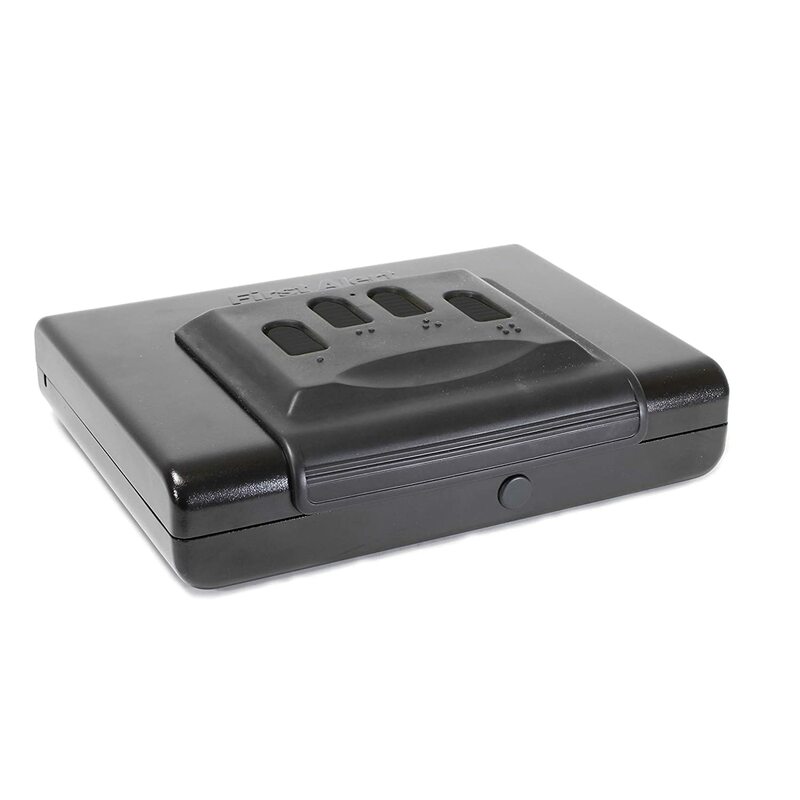 The First Alert security safe uses state of the art electronic keypad to provide maximum protection for your gun. You can program a 3 to 8 digit passcode for better security. With its no see passcode feature, youll dont have to worry about anyone seeing the code and attempting to open the safe. The safe requires two AA batteries and theyre included. Just put the batteries in, input your passcode and its ready. Just put your gun, lock it up and the pistol is safe. In addition to the passcode, the First Alert has a 1500 lb tested steel cable included. Using this you can secure the safe on your car, shelf or closet. It is also easy to mount as holes have been pre-drilled already. First Alert has manufactured a lot of gun safes, and this ranks among the best. Its got the essential features youd want in a single pistol safe, and the security features are top notch as well. Bottom line, this First Alert gun safe review is going to give this the thumbs up.